Recognized: APRI, UKC, FSS, provisionally accepted by the FCI under the name "Dogo Canario"
The Presa Canario has a powerful, square head that is nearly as wide as it is long. The muzzle is broad. The chest is deep and broad. The rump is slightly raised. This breed has thick skin, dense bones and powerful muscles and a massive head with a large jaw. The ears are usually cropped. Colors include fawn and various brindles, white markings are sometimes seen. Calm, attentive and gentle around child. Perro de Perro de Presa Canarios are confident, unafraid and even-keeled. They make great watchdogs and guard dogs, defending what is theirs to the death. They are quiet and rather subdued at home, and devoted to family. They can be difficult to train, as they can be stubborn and dominant. They certainly like to domineer over other dogs, and will not tolerate them unless they are submissive. 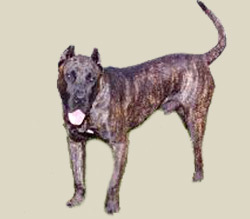 The Perro de Presa Canario needs proper training and socialization at a young age.